Searches of the Douyin app for the program -- which follows the adventures of a young cartoon pig and her family -- yielded no results on Wednesday. Bytedance, which has incurred the wrath of China’s censors in the past, didn’t immediately respond to WeChat messages and phone calls from Bloomberg News. 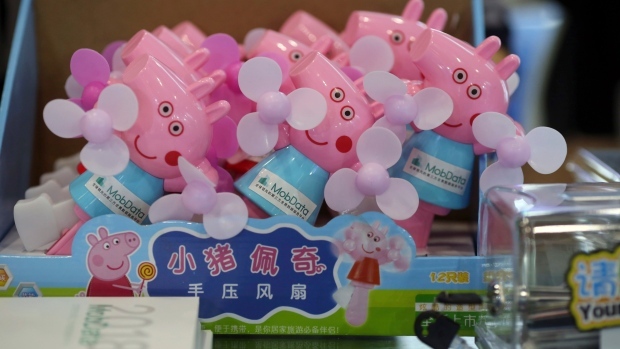 “Peppa Pig” has become a big hit in China since it first appeared on the China Central Television network in 2015. But the cartoon’s appeal has spread beyond young children to teenagers and adults, with some seizing on the character as a sign of rebellion, according to the New York Times. China Daily says Peppa Pig’s Chinese nickname -- shehuiren -- is a slang term for gangster, spurring grown-up fans to link the show to gangster rap. State media have speculated that the links to gangs and tattoos -- frowned upon in Chinese culture -- may be why Douyin pulled the cartoons. “Peppa Pig” videos have been viewed 45 billion times on the country’s video-on-demand platforms.